Apple pie Baked in an Apple. I found this amazing recipe and thought someone might like it! doesn't it look fun and creative? This is something i would want to make when i have visitors and maybe adding a little icing when they are done would just be yummy!! This is a great idea if you have kids. easy to make and the ingrediants dont cost much at all! AMAZING! Tell me what you think? is this something you would make? Thank you to UltimateWomensExpo for the recipe and the picture! Cut off the top of 4 apples off and discard. Remove the inside of each apple with a spoon very carefully, as to not puncture the peel. Remove skin from 2 additional apples and slice very thinly. These apple pieces will give you filling needed to fill the four apples you are baking. Mix sliced apples with sugars and cinnamon in a bowl. If you prefer more or less cinnamon and sugar, make adjustments as desired. Scoop sliced apples into hollow apples. Roll out pie crust and slice into 1/4 inch strips. You can also add a strip of pastry inside the top of the apple almost like a liner to add a little more texture/sweetness to the pie. 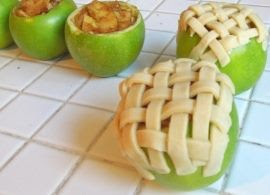 Cover the top of the apple in a lattice pattern with pie crust strips. Place apples in an 8×8 pan. Add just enough water to the cover the bottom of the pan. Cover with foil and bake for 20-25 minutes. Remove foil and bake for an additional 20 minutes or until crust is golden brown and sliced apples are soft.